Bar and Bat Mitzvah celebrations are a once in a lifetime milestone for your child in their personal and religious growth. And whether you select a simple reception to celebrate your child’s passage into the rites of Judaism, or an elaborate evening affair, we will help you create a memorable and meaningful event that you and your family will cherish. 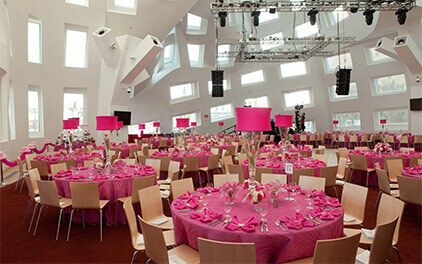 If you are looking for a Las Vegas venue as unforgettable as this special occasion, search no further. With full kosher service available, our venue is uniquely suited to your religious celebration. When your attendees cast their eyes on the undulating canopy of windows and stainless steel that is the most complex Frank Gehry design in the world, they will know they are in for something extraordinary. Create a staging area with concert hall acoustics and state-of-the-art lighting for your child’s favorite entertainer. Fully kosher capability, including kosher Narumi china. We will work directly with the Rabbi to ensure a kosher kitchen or bring in your own celebrity chef for a truly distinctive experience. We know this is a proud moment in the lives of parents and their children and take care to offer the focus on detail and personalized attention that this momentous occasion deserves. We would be honored to help you welcome your child into this new and exciting phase of religious identity alongside the community that supports and loves them.